Agricultural drones have helped in redefining agriculture in the recent past. It is estimated that introduction of drones in agriculture processes can help in increasing crop production yield, more cost efficient use of resources as well as higher returns economically. The use of drones in agricultural delivery can also reduce greenhouse effects as the drones require much lesser fuels as compared to the large bulky farm used motorized equipment. Since the introduction of agricultural drones into the market, the industry has been impacted strongly, as these drones make farming less labor driven, more cost efficient and less time consuming. These drones also help in monitoring the agricultural conditions of the farm land as well as keep an observation of the crop productions. There are various advancements to upgrade the components’ life span, monitoring and delivery capacity in the agricultural drones. Autonomous delivery drones can be used for crop protection, organic farming, seeding, data mapping and various other purposes that reduce the overall heavy duty loads from farmers back. There are various projects conducted in association with agricultural autonomous delivery drones across the globe. As an emerging market, the scope of improvement and growth of these robots are very high and is therefore expected to change the face of agriculture over the estimated period. Agricultural autonomous delivery drones market is anticipated to record a significant of 10.7% CAGR over the forecast period. Many multi-national companies are concentrating towards new product advances in agricultural autonomous delivery drones. Moreover, the many advantageous properties of agricultural autonomous delivery drones are exploited in the field of agricultural delivery and monitoring now and then. New uses for agricultural autonomous delivery drones are discovered at regular basis which is expected to drive the agricultural autonomous delivery drones market rapidly. Currently the global agricultural autonomous delivery drones market is observing vibrant growth owing to increasing demand of agricultural drones in developed countries. Advances in agricultural industry in the past few years and growing scientific explorations are projected to drive agricultural autonomous delivery drones market besides the wide range of functions of agricultural autonomous delivery drones in an immense range of processes such as assessment covering dairy farms, vegetable and fruit harvesting, in nurseries and various other purposes during the forecast period. On the basis of regional platform, global Agricultural Autonomous Delivery Drones market is segmented into five major regions including North America, Europe, Asia Pacific, Latin America and Middle East & Africa region. As redefining equipment to the agricultural industry, North America is panned to observe substantial agricultural autonomous delivery drones market growth on account of the region’s innate nature of adapting to newer technologies at a higher rate and on the back of highest developed countries present in the North-American region. North America is expected to be followed by Europe in terms of consumption due to expanding agricultural autonomous delivery drones requirements for sustainable farming and water consumption. 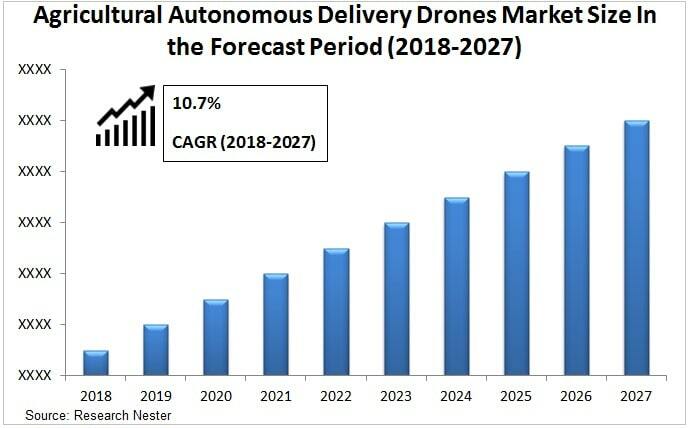 The rising demand for agricultural autonomous delivery drones for spraying pesticides, insecticides and fertilizers across farm yards for faster and efficient delivery is expected to propel the market of agricultural autonomous delivery drones during the forecast period. The increasing demand in the developed and developing countries for automation in agriculture as well as for crop production increase is anticipated to expand the market for agricultural autonomous delivery drones. Delivery drones can also be used for irrigation of farm lands, aerial seeding, precision agriculture, and mechanized farming that is predicted to drive the agricultural autonomous delivery drones market at a robust rate across the globe. The extensive ongoing research and development activities in the field of agricultural up gradation and automation are estimated to introduce new innovations and components in already present agricultural autonomous delivery drones in the market which will drive the market further. However, the factors such as security constraints and ethical concerns associated with these devices may lead to some countries restraining themselves from the use of this device which is predicted to act as a key factor in the robust growth of the agricultural autonomous delivery drones market.